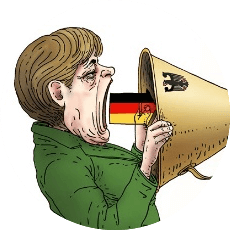 This is a guest article written by Dr. Wakako Fushikida, an Associate Professor at University Education Center, Tokyo Metropolitan University, and Professional MAXQDA Trainer. 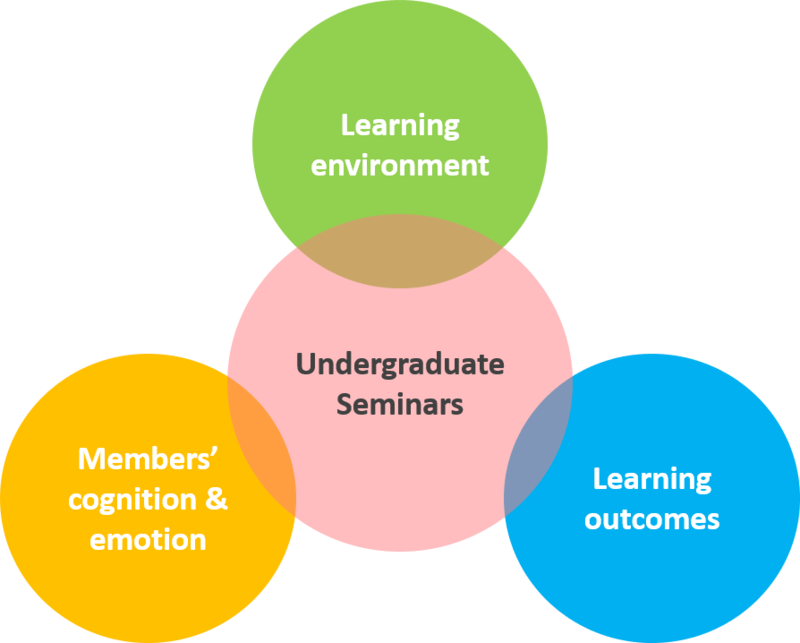 My research interest is relationships among learning environment, members’ cognition and emotion, and learning outcomes at higher education, particularly undergraduate seminars. 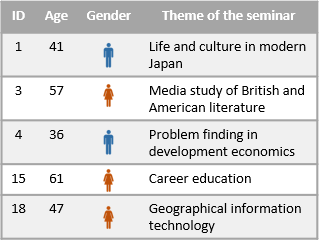 Seminars are one of the traditional learning styles at universities in Japan alongside lectures and have been regarded as important opportunities for students’ growth. 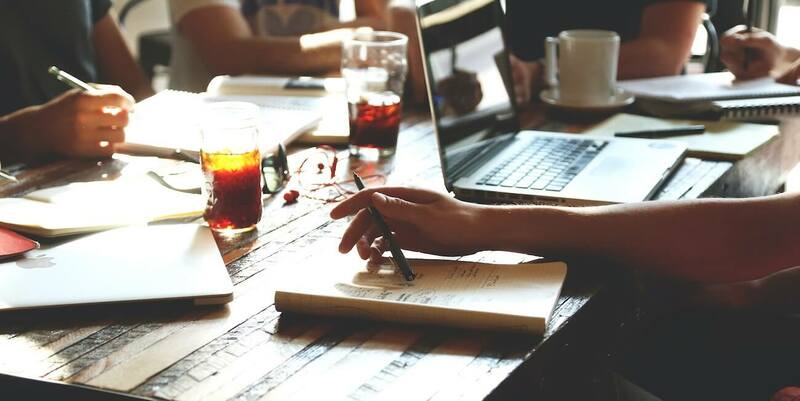 However, there is little empirical research, so I usually conduct exploratory surveys using an interview to generate a hypothesis and to make a questionnaire. After collecting audio data of faculty members and students, I qualitatively analyze the transcripts using MAXQDA. Undergraduate seminars are inquiry-based communal learning environments, affectionately called Zemi in Japan. 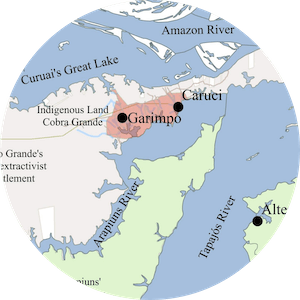 These originated in nineteenth-century Germany with the idea of education through research and were later introduced to the United States, Japan, and other countries in the twentieth century. The Oxford Advanced Learner’s Dictionary states that a seminar is a class at university or college when a small group of students and a faculty member discuss or study a particular topic. Figure 2: What are Seminars? Seminars are usually conducted for a small number of students so that the faculty member can provide more individual, careful, and interactive instruction for students than in a regular classroom. A popular seminar format is one in which a faculty member and about 10-20 students participate in a meeting intended to help the students gain further understanding of their research project, and the students receive the advice of the faculty member and other students about the state of progress and the problems with their research in a specific domain of expertise. Being an important teaching method, along with lectures in university education, seminars also represent research-oriented and dialogue-based communities of a faculty member and students, that include relationships based on mutual understanding and trust. Therefore, it is possible for students to absorb ideas and tacit knowledge of specialized fields through daily communication with seminar members. Why is Researching Seminars Important? There have been many practical reports of undergraduate seminars on the websites or university bulletins in Japan. Moreover, specific information on such matters as educational concepts of individual seminars, related learning activities, the states of the students, and the total atmosphere has been amply provided. Yet, previous studies have not dealt with the educational mindset of faculty members and the method in which they design undergraduate seminars. Therefore, to start, this study focused on exploring faculty members’ expectations about students’ growth through undergraduate seminars. Semi-structured interviews (70-110 minutes) were conducted with five faculty members who teach different undergraduate seminars for third-year students in the humanities and sociology fields. Among them, two were male and three were female, with a mean age of 48.3 years (SD=9.0). 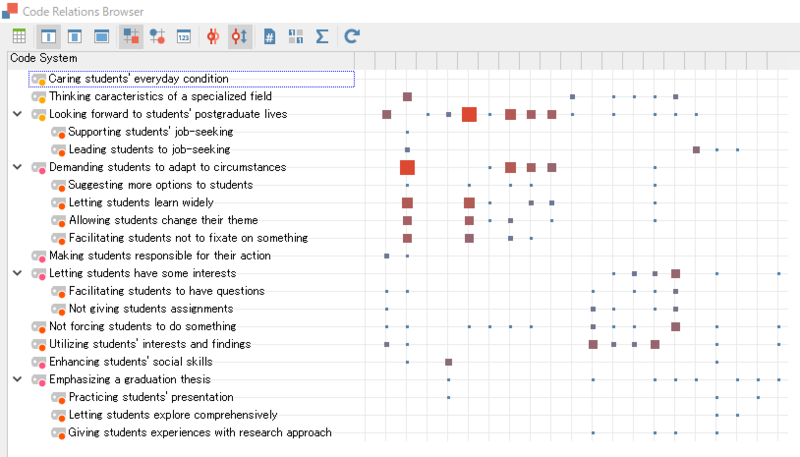 creating an interpretive model based on the above analyses with MAXMaps. First, using MAXQDA’s Code Matrix Browser function, I selected the function “Display nodes as squares” and “calculation of symbol size refers to the row” in order to visualize simply which codes were assigned to which ID’s documents (Figure 4). 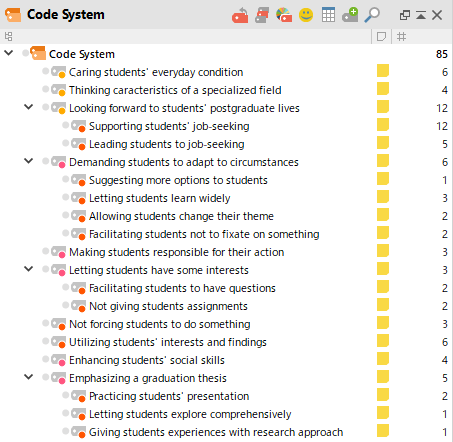 The coding results showed that faculty members had several types of expectations for students, and the major common codes were the following: (making students responsible for their actions), (letting students have some interests), (fostering students’ sociality), and (emphasizing a graduation thesis). Next, using the Code Relations Browser, I considered how many encodings exist in which two codes are present at a defined distance from one another with function “Near (codes)” and choosing distance “2”. According to the analysis, following relations between codes ware suggested: (looking forward to students’ postgraduate lives) and (demanding students to adapt to circumstances) including (letting students learn widely) or (facilitating students not to fixate on something). 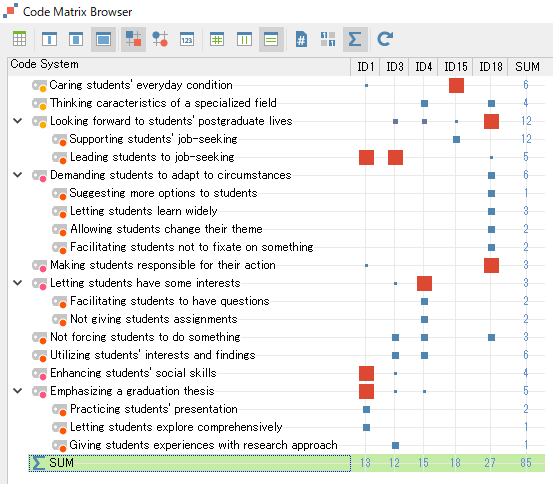 Finally, an attempt was thus made to organize and visualize the faculty members’ mindset based on the relation between these codes, their social background, and specific instruction. I used MAXQDA’s MAXMaps feature with the model templates “Code Theory Model” which is helpful for the development of my original theory. 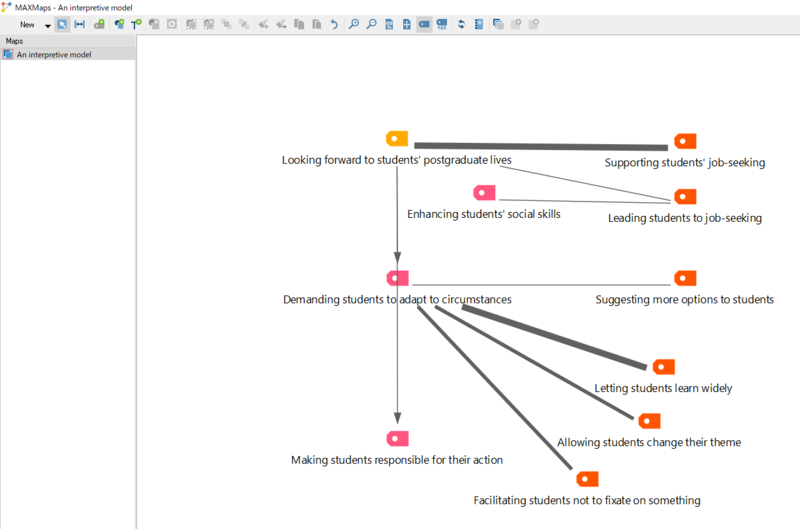 Figure 6 indicates that faculty members were looking forward to students’ postgraduate lives and that they placed more importance on students’ development of adapting to circumstances, taking responsibility for their action, and enhance their social skills. In the future, I would like to continue to conduct more interview survey with faculty members and to explore complex their mindset through analyzing qualitative data with MAXQDA 2018. Sato, I. (2008a). 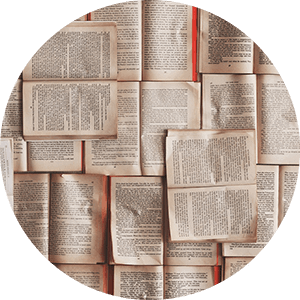 The Method of Qualitative Analysis: Principle, Method, and Practice. Tokyo: Shinyosya. Sato, I. (2008b). 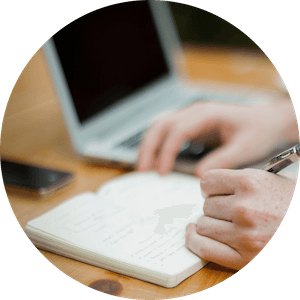 Introduction for Qualitative Data Analysis: Utilizing A QDA Software. Tokyo: Shinyosya. VERBI Software (2017) MAXQDA Getting Started Manuals, Retrieved November 1, 2018. Figure 2 is one of the free pictures that are released under Creative Commons CC0. Table 1 and Figures 1-6 are originals created by the author. This work was supported by JSPS KAKENHI Grant Numbers 17K17990. 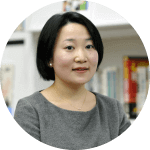 Wakako Fushikida holds a PhD in Interdisciplinary Information Studies and has conducted educational research using MAXQDA for five years. Her recent main data collection and analysis strategies focus on semi-structured interview and questionnaire data and text analysis. She has studied the psychological impact of the learning environment and is involved in collaborative projects aimed at exploring knowledge and report writing in education. Dr. Fushikida also consults for research groups in education research and offers MAXQDA workshops ranging from Starter workshops to method-focused workshops on visualizations and mixed methods. The research described in this article won an award at the MQIC 2018 Poster Session.